HARVESTING MEETS EFFICIENT POWER Regardless of crop, field condition or farm size, Case IH Axial-Flow combines are proven to produce the highest in both grain quantity and quality. 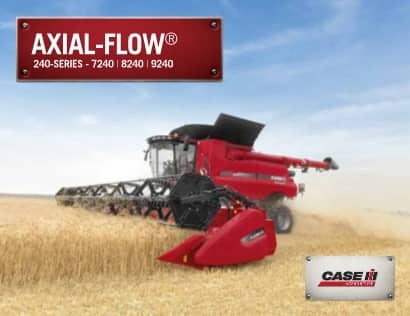 As a member of the Case IH Efficient Power family, Axial-Flow combines are designed to deliver exceptional fuel economy as well as impressive horsepower. MEET THE INDUSTRY’S LARGEST LINEUP Case IH offers the broadest model offering to meet the needs of any operation, including two Class VII models so producers can tailor a machine to their unique needs. From the hardworking, simple Class V Axial-Flow 5140 with 275 horsepower all the way up to the powerful Class IX Axial-Flow 9240 that peaks at 625 horsepower, you will find an Axial-Flow combine perfectly suited for your operation’s needs. From header to spreader, Axial-Flow series systems are carefully matched to ensure efficiency and productivity. The Axial-Flow line represents simplicity and reliability with the fewest drive components and longest service intervals in the industry. It also leads the industry with features such as the largest cleaning systems, most innovative drive systems, and largest selection of headers. SIMPLICITY Axial-Flow combines are designed with fewer moving parts for unmatched reliability and easier serviceability. CROP ADAPTABILITY Designed to harvest over 134 types of grains in many conditions. The Axial-Flow combine is versatile enough to match your diverse harvesting needs. MATCHED CAPACITY Controlling crop flow is the key to harvesting success. The Axial-Flow feeder, rotor, grain handling, residue management, and power systems are designed to optimise crop flow and maximise productivity. GRAIN QUALITY Gentle grain-on-grain threshing is the hallmark of the Axial-Flow design. From feeding to cleaning, the entire system is designed to minimise grain damage. GRAIN SAVINGS Axial-Flow combines pave the way for savings. Thorough threshing and efficient separation put more grain in the tank and more profits in your pocket. RESALE VALUE Case IH combines reward their owners with impressive resale value. A wide variety of kits are also available to enhance performance, upgrade technology, boost productivity and maximise your investment. INTRODUCING THE TRUE MOBILE OFFICE AXIAL-FLOW COMBINE CABS Thanks to your input, Case IH has taken the largest, most comfortable combine cab in the industry and made it even better, providing the ultimate in convenience, comfort and productivity for your office in the field. Double duty – side seat serves as work surface or portable lunch cooler. 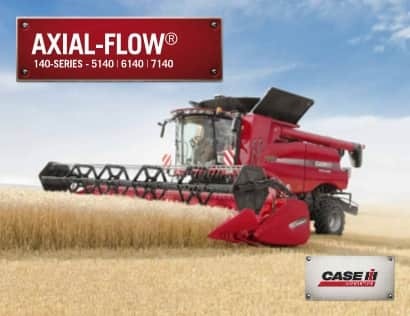 POWERFUL ADVANTAGES New Axial-Flow 40 Series combines with new technology join the Case IH Efficient Power family, delivering more power and better fuel efficiency with extended service intervals and minimal scheduled maintenance. Case IH engines are designed to provide responsive power and improved fuel economy. They also run cooler, unlike power-robbing EGR solutions. In 2015, all Case IH combines sold in Australia and New Zealand use neither EGR nor SCR (AdBlue), providing a simple, single-fluid solution. Axial-Flow combine productivity is dependent on several variables: type of crop, crop conditions, timeliness of harvest, machine settings, and operator experience. Adverse harvest conditions early in the season produce lower productivity levels than ideal harvest conditions with optimised machine settings later in the season. Machine capacity may vary, depending on conditions. The average productivity difference between each Axial-Flow model ranges 10 to 20 percent. The all-new Axial-Flow models feature added horsepower with the fuel-efficient Case IH FPT engines. The Class V Axial-Flow 5140 combine is equipped with the proven Case IH FPT 6.7 L engine, while the Axial-Flow 6140 and 7140 models utilise the Case IH FPT 8.7 L engine. The new 7240 has a 11.1 L Case IH FPT engine while the 8240 has a 12.9 L, and the 9240 has a 15.9 L engine. The 140 Series engines provide up to 50 kilowatts (67 horsepower) of power rise and the 240 Series engines provide up to 55kW (75hp) of power rise to handle demanding field conditions and today’s higher loads. The all Axial-Flow 40 Series combines offer a significant increase in fuel economy. Some of our competitors use an EGR emission-control system that slows combustion and compromises engine performance. Case IH FPT diesel engines are tuned to peak performance, offering a combination of power and fuel economy. Additionally, all 40 Series engines offer automatic low idle speeds of 600 RPM to further increase fuel savings when the combine is not under load. Economy Mode on the 240 Series reduces engine speed while roading. A SINGLE-MINDED APPROACH TO PERFECTING SINGLE ROTOR DESIGN Since we introduced our first combine featuring the Axial-Flow single rotor design, we’ve done nothing but refine and improve its performance. Now available in six models, each giving you superior grain quality and incredible overall value. We determined early on that a single rotor design was the right solution, and as the only manufacturer with this technology, we’re proud to bring it to you. AXIAL-FLOW ROTORS Axial-Flow single rotor technology has led the industry since 1977. The 240 Series combines utilise this advanced rotor technology. This Case IH revolutionary technology provides a simple design that produces superior grain quality and a better value than any other combine on the market. SHIFT INTO THE MODEL RIGHT FOR YOU Whether you want simplicity and convenience or superior control, Case IH Axial-Flow combines are available with the rotor technology right for you. Our 140 Series delivers maximum peace of mind through a simple, efficient and reliable belt-driven rotor design. Or choose our 240 Series—featuring an innovative Power Plus Continuously Variable Transmission (CVT). Its belt-free, low maintenance design, variable speed drives and unique in-field capabilities including rotor de-slug and our patented, optional header to groundspeed syncing help save time, boost productivity and deliver the ultimate in operator control. SIMPLICITY AND RELIABILITY An exclusive three-speed gearbox provides efficient power transfer from the engine to the rotor on all 40 Series Axial-Flow combines. The 5140 utilises a 2.25 in. (57 mm) wide rotor drive belt, while the Axial-Flow 6140 and 7140 utilise a 3.0 in. (76 mm) wide rotor drive belt. The 7240, 8240 and 9240 use the exclusive Power Plus drive as input to the three-speed gearbox. The three-speed gearbox also provides rotor speed overlap for improved belt life and greater power transfer efficiency, while the three-speed ranges ensure optimal positioning for commonly used rotor speeds. This unique design results in less belt slippage, the most efficienct power transfer, greater durability and increased life. THE INTERMEDIATE FEEDER GEARBOX The intermediate feeder gearbox provides efficient power transfer to the feeder top shaft and optional spiral rock drum, if equipped. The gearbox eliminates the need for chains or belts and protects the feeder with both a friction clutch on the feeder shaft and a radial pin clutch on the feeder drum. THE LOWER FEEDER GEARBOX This gearbox handles the high horsepower requirements of chopping corn heads and large headers and ensures efficient and smooth power transfer to the header. PATENTED, REVOLUTIONARY POWER PLUS CVT DRIVES CVT drives are specifically built to accommodate the higher horsepower demands of our 7240, 8240 and 9240 combines. It’s an exclusive technological advancement you won’t find on any other manufacturer’s machines. EXCLUSIVE POWER PLUS CVT. MORE POWER, LESS DOWNTIME MORE POWER, LESS DOWNTIME. The industry-exclusive Power Plus CVT delivers more power and less downtime thanks to a dedicated drive for the rotor and a separate drive for the feeder. The CVT system offers efficient mechanical all-gear drive with a hydraulic motor to vary speed. The exclusive rotor de-slug allows you to reverse the rotor from the comfort of your cab. The three-speed rotor gearbox optimises the speed range for peak efficiency. With a CVT drive, you get the convenience of hydraulic variable control and the efficient power transfer of a mechanical system. PATENTED AUTO FEEDER SPEED (OPTIONAL) Available on the 7240, 8240 and 9240, is the in-cab electronic variable feeder speed control which automatically matches header speed to ground speed, optimising grain savings in corn head applications. As crops get thinner and combines accelerate, the header and feeder speed automatically adapt to keep more grain in the bin. TAKE CONTROL OF YOUR HARVEST We pioneered rotor development back in the 1960s. Since then, refinements, enhancements, and improvements have led to the pinnacle in rotor performance, the AFX rotor. It features constant pitch impellers that draw the crop and air into the rotor. The AFX rotor can be set into many configurations, adapting to both crop and threshing conditions with the use of straight bars, spiked rasp bars, and helical kickers. Competitive rotor and cage designs can reduce productivity, and increase grain damage because of inefficient feeding and crop-control designs. AXIAL-FLOW TRANSITION CONE: THE MOST PATENTED FEATURE The transition cone is the most patented feature of the Axial-Flow. It’s simple geometry transitions crop from feeder to rotor. Crop is smoothly accelerated in a spiral motion from 5 MPH to about 60 MPH. FEEDER SIZES TO MATCH COMBINE CAPACITY Axial-Flow feeders produce a thick crop mat and utilise rolled-slat feeder chains for aggressive feeding with minimal grain damage. The enhanced crop flow results in improved rotor performance and machine productivity. strong>AFX ROTOR: THE MOST ADVANCED ROTOR TECHNOLOGY The single in-line Axial-Flow rotor coupled with a concentric rotor cage delivers gentle, multiple pass, grain-on-grain threshing and smoother crop flow – the hallmark of an Axial-Flow combine. The AFX rotor uses constant pitch impellers, rasp bars, and helical kickers to efficiently move crop through the machine for more complete threshing and greater productivity. The constant pitch impellers provide more capacity, using less horsepower and less fuel. CONCENTRIC ROTOR CAGE CUSTOMISED FOR PEAK PERFORMANCE Adjustable rotor vanes can be used to optimise crop flow and maximise productivity. Axial-Flow combines can be adjusted to provide uniform crop flow with more efficient use of power. Maintaining crop control also reduces peak horsepower demands, and consumes less fuel. GREATER CROP SEPARATION Concentric rotor cage provides positive crop control, and is perforated to allow maximum crop separation (up to 360 degrees) from the centrifugal force of the innovative AFX rotor. THE CONCAVE/MODULE WRAP THE PROOF IS IN THE GRAIN TANK! Concave/module wrap is one of the most important elements affecting combine capacity. While other brands use longer rotors, Case IH uses the concave/module wrap to gain capacity. All Case IH combines use a 30" diameter rotor. The Axial-Flow 140 Series use 156 degrees of concave wrap while the 240 Series utilise 180 degrees of module wrap. AXIAL-FLOW ROTOR MODULE WRAP OPTIONS Different rotor modules on the Axial-Flow 240 Series can be used to easily adapt to a variety of harvesting conditions. Rotor modules are composed of two sections, right and left, and are interchangeable front to back. The 40 lb. modules are secured with just two bolts and can easily be switched within minutes. The small tube (ST) rotor is standard for rice and optional for small grain producers. This rotor provides increased productivity in tough harvest conditions where rice or tough green straw would be present. ACTIVE GRAIN PAN MAXIMISE YOUR PRODUCTIVITY Designed for extra capacity, an active grain pan is utilised on the Axial-Flow 240 Series. The active grain pan helps stratify material, leaving the heavy seeds at the bottom of the pan, and the lighter MOG (Material Other than Grain) at the top. When the layers move onto the sieves, the grain falls, and the MOG is lifted in the air by the Cross-Flow™ cleaning fan. On the 240 series the Cross-Flow cleaning fan is hydraulically driven allowing a constant fan speed as machine loads increase. MANAGE RESIDUE EASILY AND EFFECTIVELY The Case IH residue management system is built to handle the tough residue associated with new crop genetics. We offer the widest range of residue management features on the market to tailor residue to your tillage and livestock demands. The system delivers consistency across the larger header widths used on the Axial-Flow 40 series combines, helps prepare the ground for next year’s crop and can create consistent windrow formations and long straw for baling. AXIAL-FLOW CHOPPERS (OPTIONAL) Axial-Flow 140 Series model choppers deliver the right residue-handling system for any operation. 40 Series combines provide the ability to switch between spreading chaff and straw, windrowing chaff and straw, or spreading chaff and windrowing straw – an industry first. MAGNACUT CHOPPER (OPTIONAL) Axial-Flow 240 series models offer the MagnaCut chopper option for unparalleled performance in the heaviest of crop conditions. The three-row helix design coupled with longer, more aggressive counter knives produces the finest cut in residue with superb adjustability to balance both cut and power consumption. The MagnaCut is so unique that it was given the prestigious AE50 Award from the American Society of Agricultural and Biological Engineers. MORE RESIDUE MANAGEMENT IMPROVEMENTS If you’re looking to enhance your field environment, uniform residue spreads are an important first step before seed, chemical and fertiliser placement. Axial-Flow 240 series models offer a new bolted paddle with enhanced geometry for increased width and even chaff spreading. Easily adjust spread width with the std three-sided spreader chute, each side controlled from the cab. A center divider also adjusts to control the spread pattern behind the combine. In addition, the windrow opening is 45% larger with an improved residue geometry to provide better windrow formation and material flow. REDUCE YOUR UNLOAD TIME Large grain tanks, longer augers and quick-folding, powered grain tank extensions and extended wear components are standard on all Axial-Flow combine models. A pivoting auger spout also saves time and effort during unload on the 240 series. 6140 and 7140 models - 300 bu. (10,570 L) grain tank. 240 SERIES OFFERS ENHANCED UNLOAD SYSTEM The entire unload system on the Axial-Flow 240 series combines includes larger components, including a 17 inch vertical tube and high capacity unload elbow. All Axial-Flow 140 series combines feature powered grain tank extensions for added convenience and easier transport and storage. PIVOTING AUGER SPOUT (240 series) An industry-exclusive pivoting spout allows easier grain cart fill. From the comfort of the cab, the operator can reposition the unloading grain stream with a single button. The unloading spout can be positioned where needed, instead of moving the entire combine. FAST UNLOAD RATES Unload rates of 3.2 bushels per second (113 litres/sec) for the 6140 and 7140; 4 bushels per second (141 litres/sec) on the 7240 and 8240; and an impressive 4.5 bushels per second (159 litres/sec) on the 9240. In addition, the independent cross auger control on the 240 series gives operators more flexibility during the challenging grain cart fill process, providing the ability to independently turn off grain tank cross augers and empty the unload auger. ON-THE-GO HARVEST MONITORING AND CONTROL Harvest is your one and only shot to monitor, map and evaluate data about your crops’ performance. You need intuitive solutions that help you gather valuable crop information right away, and that’s what AFS provides. You can immediately analyse the performance of different seed varieties and, most importantly, you have a system and support team designed to fit the way you farm. Case IH AFS harvest monitoring and mapping tools deliver all your needs. HARVEST MONITORING All Case IH Axial-Flow combines feature integrated yield and moisture monitoring sensors standard from the factory. In fact, Case IH was the first to offer this capability direct from the factory in 1996. The AFS Pro 700 display serves as your single interface to calibrate sensors, view yield and moisture information, monitor combine performance and control machine functions. Keep accurate records of seed varieties, inputs and performance from planting through harvest automatically with AFS Variety Tracking. Use data from planting for up to 30 different seed varieties per field in conjunction with yield and moisture data tracked at harvest to easily and accurately analyse variety performance. Using your AFS Pro 700 display as the interface, Auto-Cut Width adjusts combine cut width when traveling through odd-shaped fields, point rows or other previously harvested areas. It helps you prevent inaccurate area and yield calculations when used with a GPS receiver. Genuine Case IH parts are available from your local Case IH dealer.